The main goal of CAVAREV is to enable an easy and objective comparison of different dynamic reconstruction algorithms. The area of application is the 3-D and 4-D reconstruction of contrasted cardiac vessels, e.g. 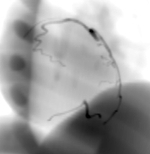 the coronary arteries using C-arm CT (rotational angiography). Various methods exist in literature with lots of nice results. However, the results can vary significantly between phantom and real clinical data. Open (i.e. public) and easy accessible projection data. Anatomically and physiologically correct projection data based on patient data. Two degrees of difficulty: (a) Strictly periodic cardiac motion and (b) an aperiodic combination of cardiac and breathing motion.